infoRouter seamlessly integrates with industry-standard authoring tools to help with creating and capturing documents. 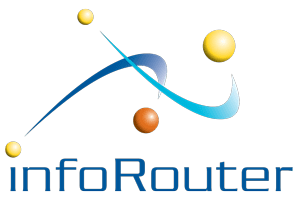 In addition to these interfaces, infoRouter offers other creative solutions to capture many types of documents from various sources. Scanned documents can be processed using the infoRouter Scan Station module where a user can view scanned documents to optionally add Meta Data, add critical information such as descriptions, provide classification. Paper documents and forms can be converted to electronic images that can be stored with an unlimited amount of meta data. Document profiling and tagging helps users quickly search for and retrieve relevant documents. Electronic Forms can easily be designed and put to use to capture forms based information which can be rendered in multiple formats. All content stored in infoRouter can be routed to defined workflows.